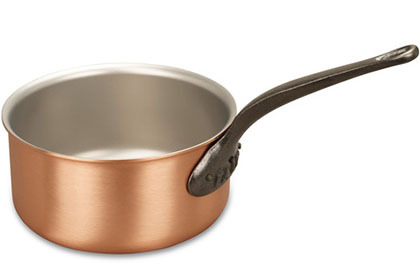 Contemporary innovation meets timeless quality with this 18cm solid copper saucepan. The even heat distribution and thermal conductivity which is copper's signature, is alchemically bonded to a fine layer of stainless steel creating an eminently useful, dependable product. Non–reactive stainless steel ensures food tastes as it should while the satinated surfaces make washing up easy. Beauty, intelligent design, classic craftsmanship, energy efficient cooking. At Falk Culinair you can expect more. As a professional chef, I've been on the hunt for proper copper pots for quite a while. They are perfect. Exactly the type of pot you would find in the best kitchens around the world. Chefs love them as they are great heat conductors, easy to clean and last a lifetime. 23 customers found this review helpful. Did you? Yes, I did! 276 customers found this review helpful. Did you? Yes, I did!